Tips, Hints, & Strategies: Steps to Effective Note Taking | Save My Reading Life! Taking notes in college can be done in many different ways. The traditional approach is to scrawl notes constantly in a lined-page notebook while the teacher lectures. Another method that is highly recommended is the Cornell Note Style. Still other students draw pictures or doodle and somehow do well. What is the trick to good note taking? Good note taking in college is as easy as 1-2-3. Regardless of the style, look, or neatness of your notes, there are three steps that all good note taking strategies have in common. Once you learn these three steps, any kind of note taking you do will improve. Step 1: Take Appropriate Notes in Class. This may seem obvious, but knowing what to write and what not to write is important to successful note taking. First, you want to make listening your most important task while you are in lecture. Second, you want to rephrase in short, clear language what is being said. Third, write those short, clear phrases in your note book. Be mindful of the types of information you are writing. Writing down information that will be provided to you later, or information that is already available in your textbook (or another source) is a waste of your time, paper, and ink. How can you know what’s important? 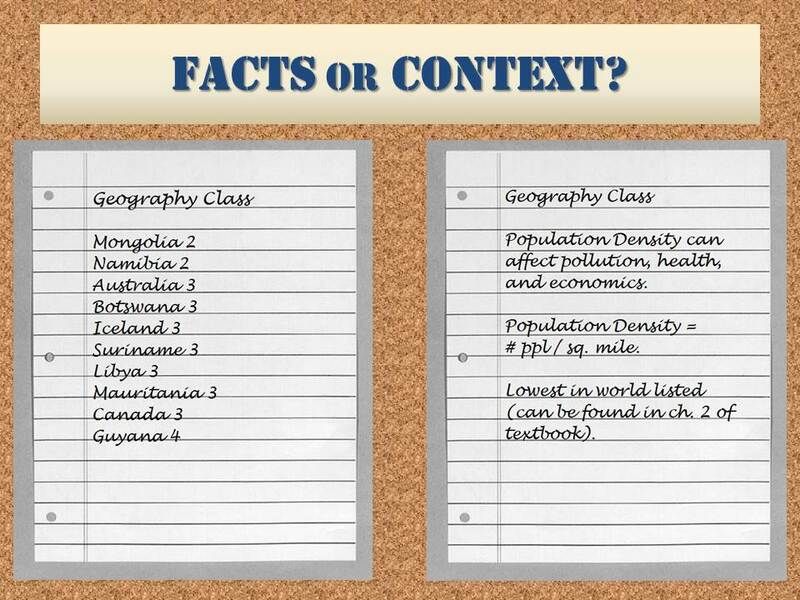 In the Lecture Note Taking Workshop, I go over the difference between facts and context. Facts can be important but facts rarely change and often can be found in your textbook or in other class resources. Context, however, is why those facts are important. Take a moment to examine the two different note pages in this picture: These two very different note pages are actually from the same class and the same lecture, however the student on the left wrote down the facts (a list of countries with the lowest population density), while the student on the right wrote down the context (why the teacher was talking about the countries with the lowest population densities and what was important). While the student on the left frantically wrote down the list and did not pay attention to context, the student on the right summarized briefly what the teacher said about population density, wrote down the formula, and even noted that the teacher put a list of the lowest countries on the board. This is the difference between facts and context and is also why listening carefully to why a fact is important is much more important than just simply writing fact after fact in your notes. Instead of spending time writing down facts, especially those that can be found later, it would be better to stop writing briefly, and listen to what your teacher is saying about those facts. Then, once you have some understanding of the context, then begin to write down your notes. Step 2: Review Your Notes Immediately. Effective note taking does not end when the lecture does. The next step to effective notes is reviewing them soon after you finish your lecture. Within 24 hours is the ideal but within 48-72 hours can work, too. Check your notes for errors and misinformation. While note taking, it can be hard to record everything accurately. Missing words, incorrect names, and even spelling errors can be detrimental later if you do not correct them. While the information is fresh in your mind, look over your words for anything that could be incorrect and make a point to fix it. Add any information you may have skipped or missed. It’s impossible to write down every single thing your teacher says–even the fasted note-takers must skip some things in order to write more important things. However, if your notes are good enough, the information you did write should be a reminder of the things you did not. Again, while the information is fresh, you can go back and add that information you needed to skip. Add any relevant book our other source information. Adding any paraphrases, notes, examples, or pictures from any other sources will help you to condense the information into one place for studying later. Sometimes the books or outside sources offer examples or explanations that make more sense than the ones provided in lecture, so having those next to your teacher’s explanation can help you later when studying. Pull out key terms, create short paraphrases, or write down potential test questions. Remember that the whole point of taking notes is to be able to use them to study for midterms and finals exams which can be weeks or even months away. I tell my students to always keep their “eye on the prize” when doing school work and, by this, I mean that you should study in such a way to reach the goal. In this case, to do well on your exams. Trying to predict questions, anticipating terms you will need to know, and paraphrasing important information are important ways to keep your eye on the prize. Write a short summary of the lecture. Typical of Cornell Notes, it can help to write a 2-3 sentence summary of the entire lecture. Write the summary in the same spot on the paper each time so you can refer to the summaries when you must flip through your notes later to find specific information. Cornell Notes style usually calls for writing the summary at the bottom of the page, but other places to consider are the very top of the page (in the space without lines), or even on the back of the sheet. Remember, whatever you decide, to be consistent. Most teachers begin class by asking some variation of the question: “Does anyone have any questions about our last class?” Make it your goal to have at least one question that you pull from the previous lecture to help you clarify the information. Step 3: Continue to Review. Another seemingly-obvious step, it might seem, but reviewing your notes is one of the most important things you can do to keep the information in your long-term memory. What many students do not realize is that reviewing does not have to be a long, time-consuming process. Integrate your review into your already-existing study plan as a way to activate schema. Make reviewing your notebook the first thing you do to activate your schema before you begin you study sessions. Simply flip through the previous pages of your notebook, glancing through anything you’ve highlighted, paraphrased, or any questions you’ve raised (like potential test questions) to help ready yourself to study. This can take as little as 5 minutes. Review your notes briefly just prior to lecture. Getting to class early is always a good idea so you can get out your materials and be prepared when class begins. Another good reason to get there early is that it will provide you with a few minutes to review the material in your notes before you begin taking notes for that class session. This will not only help you keep the older material fresh in your mind, but can also help you integrate the new lecture material into the older material. Review material more often at first, and less often over time. Begin reviewing new material every single day for a week or two. Then, review that same material only twice or three times a week for a month. Then, continue to review that material once a week for the rest of the semester. This is a basic review schedule. For material that is harder to remember, review it more often; for easy-t0-remember material, less often. 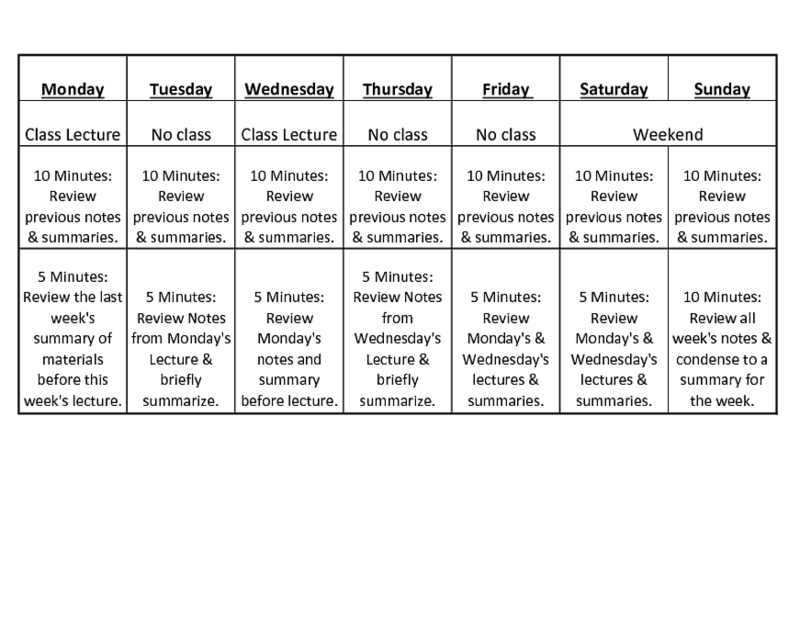 When it comes to a review schedule, it is important to remember that no one schedule will fit everyone’s needs and that the schedule may even be different from semester to semester and from class to class. Do what works for you and, if it does not work, do not hesitate to change the schedule as needed.